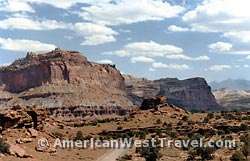 This section of the Southern Utah Travel Guide describes national parks, national monuments, and other attractions in southern Utah or northern Arizona that are close to Grand Staircase-Escalante National Monument or the Scenic Byway Utah-12. The image, below, is a sandstone reef in Cottonwood Cove, part of the South Coyote Buttes unit which is part of the Paria Canyon Vermilion Cliffs Wilderness. Open Grand Staircase-Escalante Locator Map in separate tab for reference. Set zoom (width) at 100% for best viewing. Official Grand Staircase-Escalante National Monument Map. JPG file suitable for on-line viewing. Official Grand Staircase-Escalante National Monument Brochure. JPG file suitable for online viewing. Geologic Road Guide to Grand Staircase-Escalante National Monument. PDF provided by the Utah Geological Association. Mile-by-mile guides for the back roads. Good navigation aid. Road Conditions for Grand Staircase-Escalante National Monument. (NPS). Bryce Canyon features spectacular geology, unique in the world, consisting of a series of horseshoe-shaped amphitheaters carved from the eastern edge of the Paunsaugunt Plateau in southern Utah. The erosional force of frost-wedging and the dissolving power of rainwater has shaped the colorful limestone rock into bizarre shapes including slot canyons, windows, fins, and hoodoos. All are tinted in a wide array of rich colors. The whimsically arranged rocks create a surreal landscape of mazes, with exciting and unusual hiking trails. The park offers a network of trails varying from easy to strenuous. Most are fairly short and conducive to day hikes. The park road (quite busy in season) has many excellent vista points. There are two campgrounds and a lodge. Park elevation is at 8,000 feet which bring cold, snowy weather and limited services during the winter. More lodging and services are available outside the park entrance and are listed in our Bryce Canyon National Park Travel Guide. Zion National Park in southwestern Utah is about a three hour drive from Las Vegas. The park is world-famous for its soaring, colorful monoliths such as the Great White Throne and Angel’s Landing. Besides its great heights, Zion is also known for its amazing canyons. The park’s most visited attraction is the Riverside Walk (Gateway to the Narrows trail). The paved trail follows the beautiful Virgin River about a mile through its lower canyon, where sandstone cliffs about 1/4 mile apart tower thousands of vertical feet above the river. The park offers a network of trails varying from easy to strenuous. Many short and easy walks are available in Zion Canyon. Generations of serious hikers have been challenged by the Angel’s Landing Trail, the Zion Narrows, and the Subway. The park road has many excellent vista points. The road through Zion Canyon is accessible by free shuttle bus service only. The service conveniently extends into adjacent Springdale where most of the lodging is located. There are two campgrounds and a lodge. Weather is hot during the summer. Zion is reached from Las Vegas by I-15 north and UT-9 east. From US-89 (Kanab, Bryce Canyon), take UT-9 west 25 miles at Mt. Carmel Junction. It is about 80 miles and 90 minutes from Zion to Bryce. The Paria Canyon-Vermilion Cliffs Wilderness Area encompasses one of the finest canyons in the American Southwest and one of the most spectacular slot canyons, the Buckskin Gulch. It also includes the scenic Coyote Buttes North and South areas. These remote day-use areas offer extremely exotic scenery including the famous Wave in Coyote Buttes North. All hiking and backpacking trips require a permit of which there are a very limited number. The permits are on a reservation system, and you typically need to reserve permits months in advance. Permits for Coyote Buttes North, site of “the Wave”, are on a lottery system and are extremely difficult to obtain. Paria Canyon-Vermilion Cliffs Wilderness Guide – Detailed information on Paria Canyon, Buckskin Gulch, Coyote Buttes, and “The Wave”. Located roughly between Bryce Canyon and Zion National Parks, Cedar Breaks National Monument features an immense and colorful amphitheater, nearly three miles across and over 2,000 feet deep with formations very similar to Bryce Canyon. It is located on a high plateau exceeding 10,000 feet elevation at its top. Therefore the monument features subalpine forests and pretty meadows as well as a cool and refreshing summer climate. Located in northern Arizona a few miles south of Kanab, Utah, Pipe Springs National Monument features the well-preserved remnants of a 19th century Mormon farming settlements. There is demonstration farming with ranch animals and working orchards and garden. Guided tours are offered through the original buildings which are meticulously maintained. Scenic Byway Utah-12 ends at Utah-24, a few miles west of Capitol Reef National Park. The park offers another different and unique look at the fantastic sandstone erosion of southern Utah. The 100-mile long Waterpocket Fold, a buckling of the earth’s crust, runs north-south through the park. The erosion of the Fold has resulted in a wide array of colorful sandstone formation, most notably the huge domes and cliffs in the northern part of the park. The park is also rich in arches, natural bridges, and slot canyons. Cathedral Valley in the far north end of the park features a bizarre world of cliffs and spires (4WD recommended). Capitol Reef is also rich in history, from the ancient Fremont people to 19th century pioneers. Look for the large rock art panel on Utah-24. The pioneers’ orchards at the settlement of Fruita produce fruit to this day, and park visitors may pick ripe fruit at no charge during the summer. Highway-24 is part of the Capitol Reef Scenic Byway. Most travelers will continue east to reach Lake Powell or Canyonlands and Arches National Parks. The section between the park and Hanksville is a strange desert full of rocks and sandstone formations which have their own unique, stark beauty. Visit time: you can see some of the park’s highlights in a few hours or spend a few days exploring the many trails and side roads. Lake Powell features water recreation, boat tours, fishing, and spectacular scenery. Center of activities is at Wahweap Marina at west end of lake (off US-89 north of Page, Arizona). (10a) Hole-in-the-Rock – Historic crossing of Colorado River by Mormon settlers. Steps blasted into cliff created a trail at a 45 degree slope. (12) Escalante River – One-lane bridge over Escalante River. Generally good hiking in and along the river. 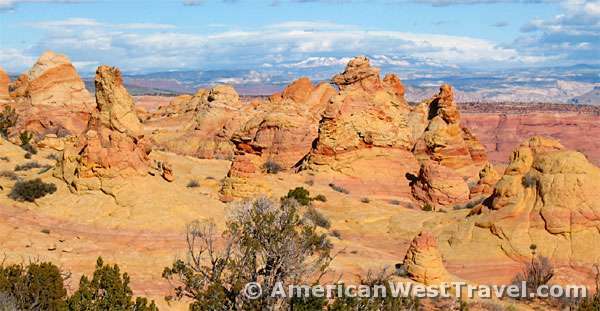 (12a) Hurricane Wash & Coyote Gulch – Most popular hiking areas in the Escalante drainage. Dry Fork of Coyote Gulch accesses Peek-a-boo and Spooky slot canyons. Lower Coyote Gulch features arches and a natural bridge. (17b) Glen Canyon – Scenic canyon below Glen Canyon Dam is quite similar to the bottom of the Grand Canyon. Features a popular trout fishery, and an excellent one-day raft trip. Access by car is at Lee’s Ferry, the exit point for the Paria Canyon hike, and is the starting point for all Grand Canyon Raft Trips. (17a) Rainbow Bridge National Monument – World’s largest natural bridge in spectacular setting. Most commonly accessed by boat tour from Wahweap Marina. Read our article on “The Trail to Utah’s Rainbow Bridge – Retracing a Historic Journey“. Present-day backpackers can select one of two trails to reach Rainbow Bridge from the Navajo Reservation. The separate Upper and Lower sections are accessed by guided tours originating in Page, Arizona or at the Antelope Canyon entrances. This famous slot canyon is known for its surreal photo opportunities. Tours are about two hours. Midday is best when the sun peeks into the canyon. Completely level, easy walking in Upper Antelope. Lower Antelope is narrower and involves a number of small ladders (and is therefore less crowded). Located on AZ-98 about 5 miles east of Page, just west of the large generating station. Lower canyon entrance – turn north on Antelope Point Road; Upper canyon – on south side of AZ-98.